Inside the house laughter built: Robin Williams' still for sale $30 million Napa Valley property gives rare insight into the actor's private world Archi-new - Free Dwg file Blocks Cad autocad architecture. Archi-new 3D Dwg - Free Dwg file Blocks Cad autocad architecture. 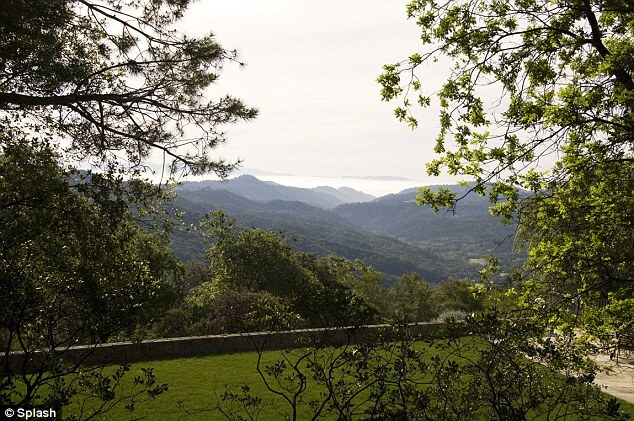 It may be known as the Villa of Smiles but since Robin Williams' death, his Napa Valley home's for sale listing is now tinted with sadness. The late actor had put the home on the market months before his August 11 death, saying he could no longer afford the sprawling mansion in the middle of California wine country. The Hook actor had the home built to his requirements in 2003, and images of the property provide a rare look inside the star's private world. While many celebrity mansions are staged and sanitised so that their owner's identity is hidden, Robin's hand can be seen throughout the main house and the 650-acre property. Featuring a staggering 20,000-square-foot five bedroom, six full and five half bathrooms main house and a four bedroom guest house, the 'ranch' as Robin called it, had provided a hideaway from Hollywood for the star. 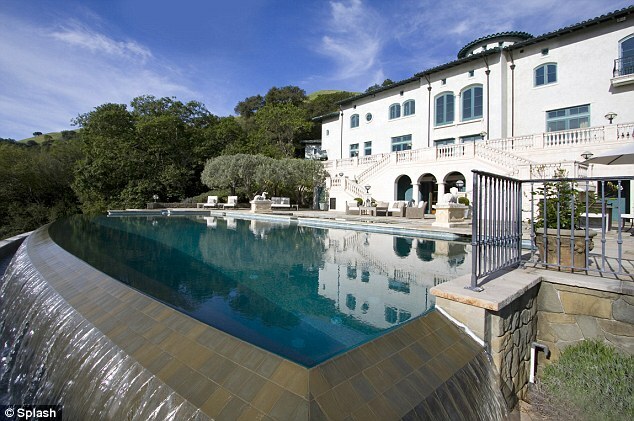 However, he had tried to sell the home in 2012 for $35 million but did not find any buyers, then in April re-listed the home for the reduced price of $29.9 million. Despite his tragic death, the home remains an active listing with Joyce Rey and Cyd Greer with Coldwell Bankers, on behalf of the funnyman's trust. 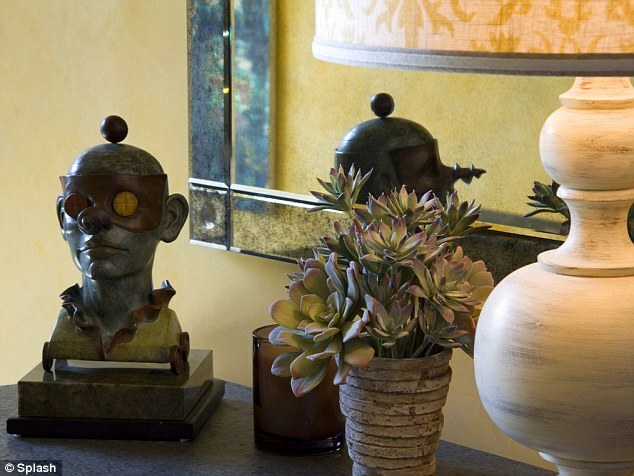 While at first glance the Villa Sorriso - Villa of Smiles - looks like any other mansion with its blend of understated furnishings coupled with antiques, on closer inspections Robin's touches can be seen everywhere. The Portuguese limestone house's study was clearly where the Mrs. Doubtfire star retreated to read and rest. 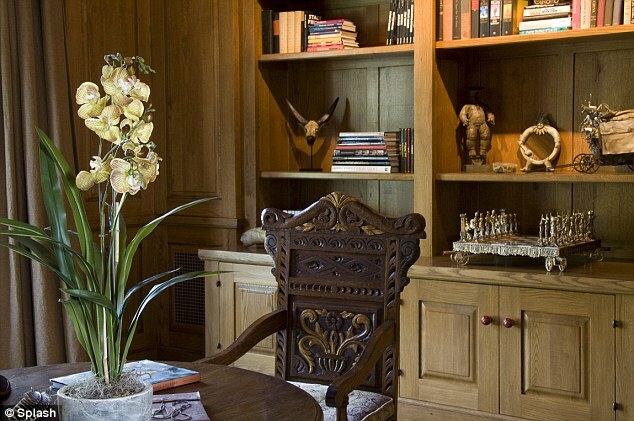 The built-in book case is filled with objects to inspire the comedian and thinker, including a hand carved chessboard, antiques and sculptures from around the world, and an extensive book collection. Arranged into genres such as art, travel, film and wine, his library includes everything from comedic encyclopedia Laughing Matters, The Curse of Lono by Hunter S. Thompson, the thought provoking Salman Rushdie's The Moor's Last Sigh and celebrity profiles in Show and Tell by John Lahr. But just like the comedian himself, with every deep thought came a laugh, and alongside the books the iconic actor also kept his Hollywood figurine collection. A child at heart - Robin even named his daughter Zelda after a computer game character - the actor collected figurines of some of Hollywood's most legendary characters and actors including Marilyn Monroe, Frankenstein's monster, Jaws and Disney's rendition of Captain Hook - the character he famously faced off against in the live action retelling of Peter Pan. 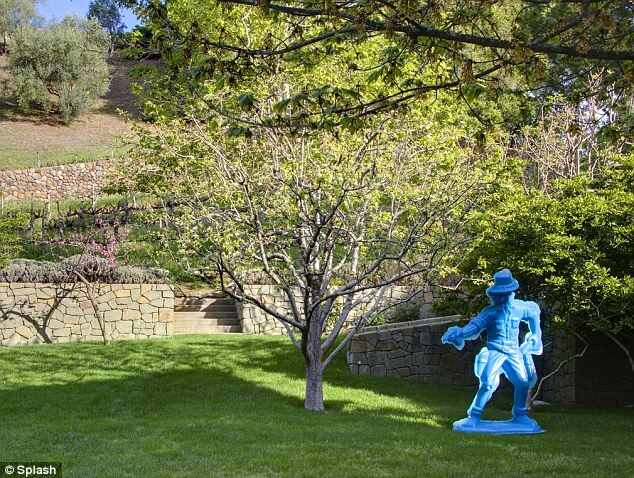 Outside in the property's sprawling grounds, which features a winery and extensive views of the surrounding Sugarloaf Ridge State Park, Robin's playful side is also evident with giant plastic retro 'cowboy and Indian' action figures scattered around. 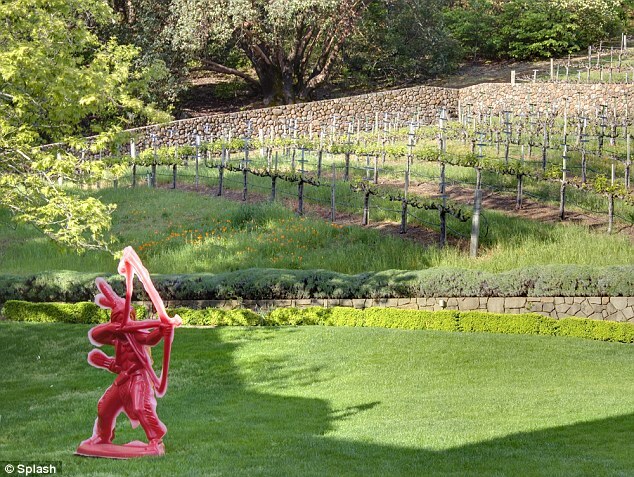 The life-sized bright red and blue figures are hard to miss against the luscious green landscaping and vineyard which produces Cabernet Sauvignon, Merlot and Cabernet Franc varietals. The large property also features a stunning infinity pool abutting the main house that is an amazing 65 feet long. 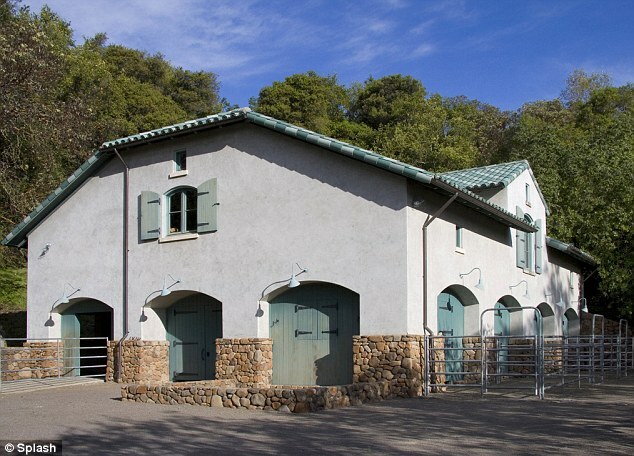 Also contained within the grounds is a seven-stall horse barn, tennis court, hiking and riding trails, a spring-fed pond, and, more than 100 olive trees which produces gallons of olive oil every year. While beautiful, the home was a strange choice for the star whom had struggled with alcoholism previously. 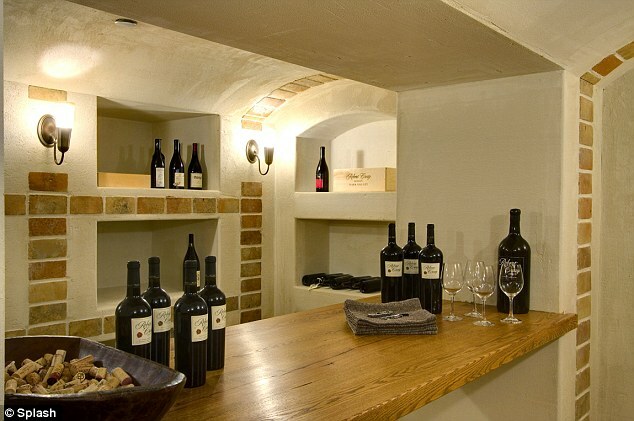 Not only does the Villa produce various wine varieties but it also has a wine cellar, which was fully stocked with its own reds during the home's photo shoot. It was not this issue which led to the star putting his home back on the market in April, it was instead his battle to stay solvent. He told Parade Magazine: 'There are bills to pay. My life has downsized, in a good way. I'm selling the ranch up in Napa. I just can't afford it anymore. 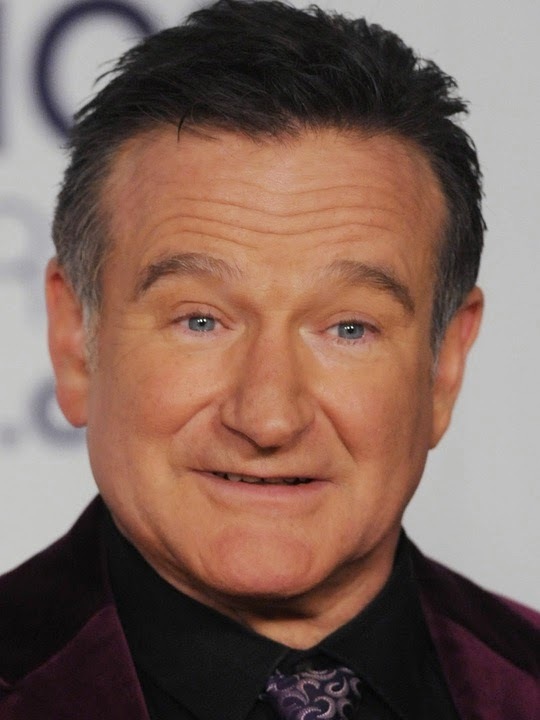 Robin's publicist has since said the star had no financial troubles at the time of his death saying, 'Reports suggesting Robin may have had financial issues are simply false. 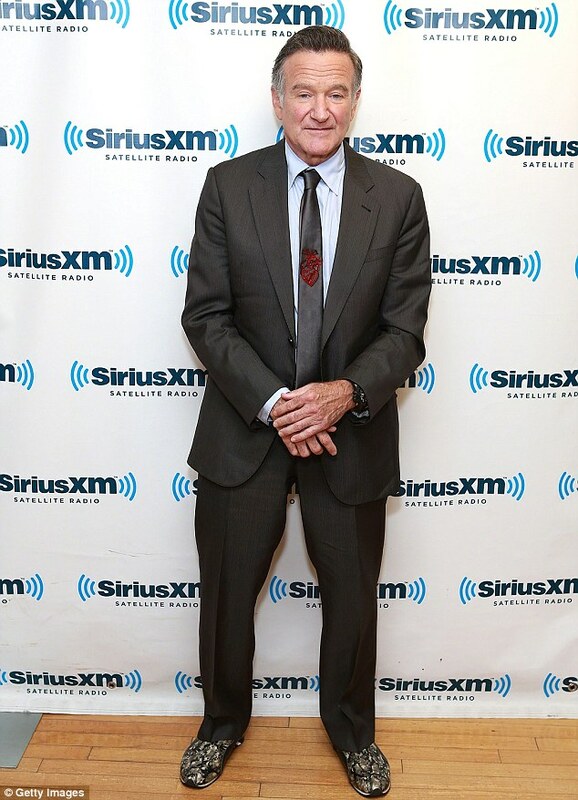 The actor was found dead around lunchtime on Monday August 11 after taking his own life after battling with depression and coming to terms with a diagnosis of Parkinson's Disease. He was 63.